Imhotep players sharing the trophy with their fans after beating Sharon to win the 2018 Class 4A state championship. The final weekend of the PIAA basketball season is here, and eight local teams have the opportunity to finish their season with a victory and a state championship. Here is a look at the seven games — two locals play each other — scheduled for Thursday, Friday, and Saturday. All games will be at the Giant Center in Hershey. Class A boys: Sankofa Freedom vs. Vincentian Academy, 2 p.m.
Sankofa Freedom has made playoff history in blowout fashion. As if winning by 55 points wasn’t enough — 99-44 over Conestoga Christian in the first round — the Warriors also won by 41, 29 and, most recently, 17 points, against Lourdes Regional in the semifinals. Now they are in the state championship game for the first time. “It’s a special time for us all across the board,” Sankofa coach Isaiah Thomas said. “I’m excited for the children and the parents. It’s an amazing feeling." Scott Spann and Derrius Ward have been a one-two punch for the Warriors during their playoff run since winning the Public League Class A final in February. In the last five games, one of the two players has scored at least 20 points, and the two have combined for 77 points in the last two games. Kobe Devine and Khalil Turner play solid defense for the Warriors and can also contribute points. "We’re not content, but we’re in a great space right now,” Thomas said. Class 4A boys: Bonner-Prendergast vs. Imhotep, 8 p.m. Familiar faces meet again in this game as the teams repeat their District 12 championship game. A missed desperation halfcourt heave by Imhotep at the end of overtime was all that separated the teams in the first meeting. 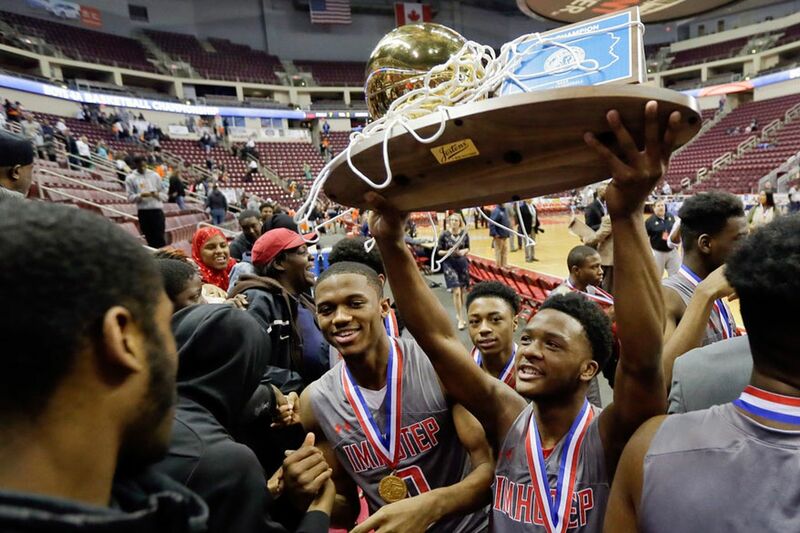 Since then, the Imhotep Panthers have rolled through the playoffs, beating teams by an average of 21 points even without 6-foot-7 Maryland recruit Donta Scott in the semifinals against Hickory. Now, Scott is back and can end his high school career with a third consecutive state title. Bonner-Prendergast’s Isaiah Wong, a Miami recruit, notched a double-double against Imhotep in the District 12 final, scoring 17 points and grabbing 10 rebounds. He’s been contributing on both ends of the court throughout the state playoffs. Against Nanticoke in the second round, he had 11 points and nine boards. In the semifinal win against Lower Moreland, Wong had 10 points and eight rebounds, along with two blocks. But what might be the most intriguing aspect of this game is what other players have brought to the table. Bonner-Prendergast 6-foot-9, 240-pound senior Tariq Ingraham had 14 points and seven rebounds, all while barely playing in the fourth quarter of the 83-47 blowout semifinal win. Forwards Elijah Taylor and Chereef Knox have been essential to Imhotep’s tournament success, combining for 38 points against Bishop McDevitt-Harrisburg in the quarterfinals and 28 in the second-round game. Class 2A boys: Math, Civics and Sciences vs. Bishop Guilfoyle, 2 p.m.
An old-fashioned Public League slugfest was held Tuesday between Math, Civics and Sciences and Constitution to earn the right to play for this championship. And MC&S will be looking for even more clutch play on Friday. Junior guard Jabarr Slaughter saved the Mighty Elephants’ season by knocking down a three-pointer at the buzzer to send the game against Constitution to overtime. Tvon Jones and Semaj Mills are also scorers for MC&S. After trailing Constitution by 19 points at one point, MC&S is going into the title game against Guilfoyle with tons of momentum. Class 6A girls: Garnet Valley vs. Peters Academy, 6 p.m.
After winning its first district championship, Garnet Valley has played four games in the state tournament that have been as different as can be. In the first two games, the team won by 18 and 20 points. In the last two, the Jaguars have barely gotten by, beating Council Rock North by two and Neshaminy by three. Emily McAteer, who has been key to the Jaguars’ success this season, is averaging 17.5 points in the tournament and likely will be a huge factor in the final game of the season. Garnet Valley forward Emily McAteer shoots against Neshaminy guard Kristin Curley during the PIAA District 1 Class 6A championship game. Class 5A boys: Archbishop Wood vs. Mars, 8 p.m. In Archbishop Wood’s first-round win over Holy Ghost, sophomore Jaylen Stinson shot just 1-for-7 from the field and had just eight points. Offensively, he wasn’t right. But Stinson made up for his offsensive shortcomings with his defensive prowess, recording four steals. “Our motto right now is to not be satisfied and keep pushing,” Stinson said after the win over Holy Ghost. Since then, the offensive side of Stinson’s game has come back. He scored nine, 15 and 17 points, respectively, in the last three games. Wood was pushed by Abington Heights in the semifinals, but Stinson scored six of his 17 points in overtime to lead the Vikings to their second state championship in three years, their first since Villanova’s starting point guard, Collin Gillespie, was the Wood leader. The key so far for the Vikings has been their ability to distance themselves from opponents. Before the state playoffs, they were 9-2 in games decided by 10 or more points and just 7-4 in games decided by nine or fewer. So far in the PIAA Tournament, they have won all four games by more than 10 points. Class 5A girls: Archbishop Carroll vs. Chartiers Valley, 6 p.m.
Archbishop Carroll has proved it can win in a number of ways. In the Patriots’ quarterfinal win over Archbishop Wood, coach Renie Shield’s team put on a clinic by beating the Vikings, 63-48, in a game that wasn’t was close as the score. Carroll made 10 threes in the game, with senior guard Mary DeSimone draining four them among her 16 points. Senior forward Erin Sweeney had 19 points, made two threes, and did the rest of her work driving to the basket. Freshman point guard Grace O’Neill, who runs the show on offense, added 15 points. Erin Sweeney of Archbishop Carroll looks to shoot as she is guarded by Noelle Baxter of Archbishop Wood during a PIAA Class 5A quarterfinal. In Carroll’s semifinal game against Southern Lehigh, the Patriots weren’t clicking on all cylinders. They had to grind out a 39-32 overtime victory to advance to the final. Class 6A boys: Pennridge vs. Kennedy Catholic, 8 p.m.
After losing three times to Abington, including one game that sent it home in the District 1 semifinals, Pennridge got its revenge in the second round of the state tournament. It didn’t come easy, though, as the Rams were able to hold on for the 55-51 win over the Ghosts in the second round. It’s been that kind of tournament for Pennridge as it barely got passed Lincoln in the first round, winning 49-45. The Rams then edged Abington, crept past Methacton thanks to Navy recruit Sean Yoder’s buzzer-beater, 50-47, and outlasted La Salle, 52-47, with some help from Jack Gillespie’s three-pointer. But it’s all been new to Pennridge, too, which might be the most exciting part of this all. The win against Methacton was the program’s first trip to the quarterfinals, so the Rams have already notched two more milestones with the semifinal win and now a championship appearance. Can they reach a third milestone with a first state title?